You may be annoyed at people who overshare their fitness stats (Look! I ran 10km, and you can trace my route precisely!) and photos toned bodies (#fitspo #fitspiration) on Facebook and Instagram – so am I. But one particular group of businesses watches on gleefully as a burgenoning number of fitness enthusiasts are taking to social media to publicise their participation in fitness activities; smaller players in the health and fitness industry are riding on the wave of the fitness obsession on social media to compete on equal grounds with larger commercial entities. 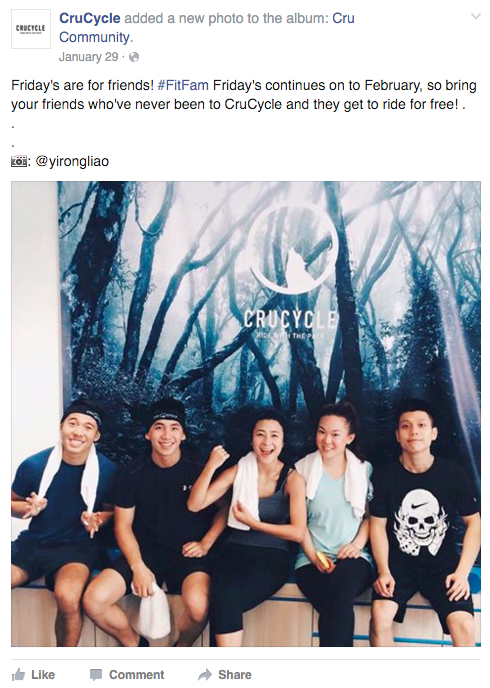 CruCycle is a locally-owned boutique indoor cycling (spinning) gym located in a nondescript shophouse on Duxton Road. 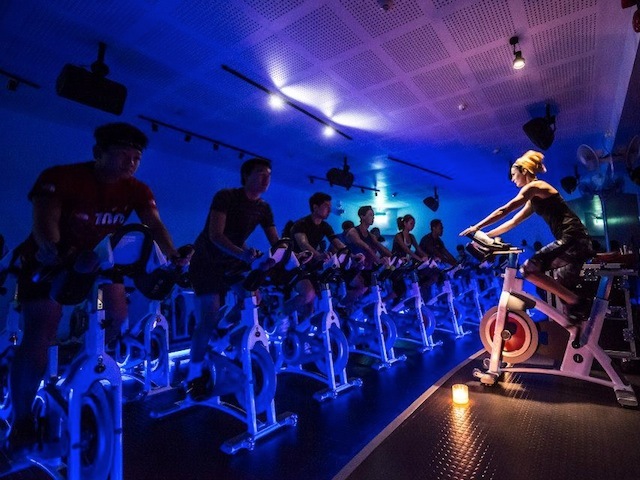 As it turns out, CruCycle’s own use of social media and its target audience’s (fitness enthusiasts) social media usage patterns are the levers effecting powerful word-of-mouth (WOM), making spinning one of the top exercise trends in Singapore in 2015. Core customer value-wise, spinning is perfect for office cubicle rats who lack time, dislike the pain of physical exertion, but desperately want the toned bodies they see on Instagram. RQ 1: How has CruCycle used social media to attract and engage its target audience of fitness enthusiasts to achieve its business objectives? RQ 2: How do the unique features of CruCycle’s brand community and fandom help to propagate it through word-of-mouth (WOM)? 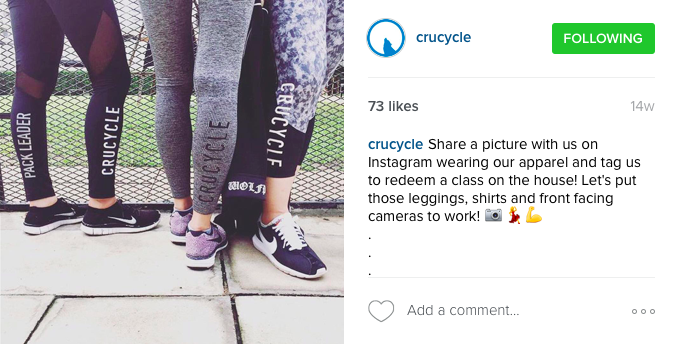 CruCycle carries out a two-pronged storytelling approach on Facebook and Instagram to establish its brand identity. – Personal stories of clients and instructors also add a dimension of emotional connection. The diversity of storylines string together to communicate a brand promise in an engaging, narrative form, that not only creates emotional connections, but inspires potential customers that they, too, can better their lives by embodying the same values that CruCycle’s members do. With its distinctive brand identity, CruCycle has also successfully established a strong fandom around its brand. 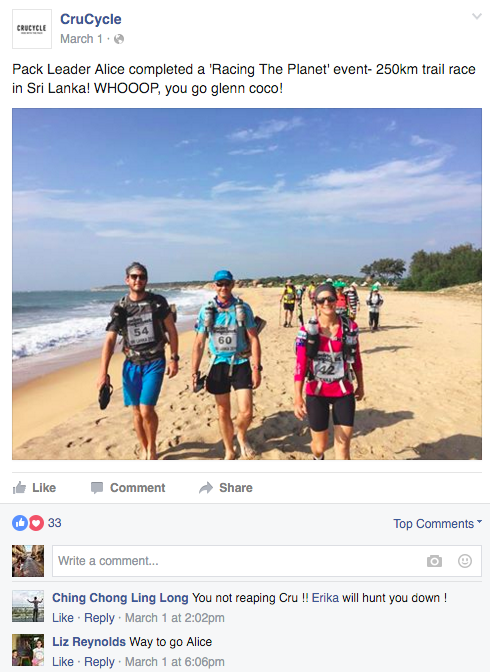 “Pack members”, as they are affectionately known, tying in with the canine mascot and “Ride With the Pack” slogan, promote the brand on their social media accounts out of their own initiative to fulfill their need for social validation (the oversharing we all know), but invariably acts as a promotion of the brand to their network. 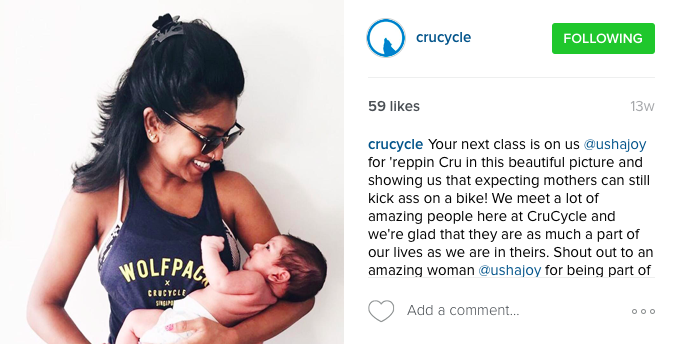 Interestingly, CruCycle’s influencers are its “pack leaders” or spinning instructors, who embody the brand’s values and beliefs and thus reinforce community rules and practices. Yet, they are celebrated as pseudo-celebrities by CruCycle (they occasionally post “Get to Know” articles on their pack leaders) and pack members see them as life mentors with whom they have a personal connection. Pinterest: Pinterest is the third and final social media platform that CruCycle has a presence on. However, it was not updated for the entire period of my research and served as the company’s own inspiration board (e.g. interior design ideas, presumably for its gym). As CruCycle ventures into sportswear design, Pinterest can be looked into as a possible avenue for marketing its products to consumers due to its highly visual nature. Pinterest has in fact been known to increase click-throughs to brands’ own websites, and could drive greater awareness. Core story framework: I also proposed a single core story framework that features a “person-like-me” character who, under the brand mentorship of CruCycle and its unique selling propositions, manages to achieve her goals. This could unify and focus CruCycle’s current storytelling techniques. I don’t know about you, but it’s interesting how social media has changed the dynamics of business. These days, it isn’t enough to deliver a good product or service. In order to reap the benefits of longstanding customer loyalty, business must appeal to customers’ deep-seated desires, something that is equally difficult to accomplish for startups, SMEs and large conglomerates, relying on pull rather than push factors. Social media is a huge part of proactively communicating these intangible benefits, making fitness a whole new ball game (pun intended).